Dianthus 'Coral Reef'. Frilly and feminine are two words that come to mind when I think of this beautiful new selection of Dianthus. 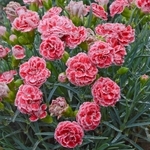 Its large 1-1.5”, fully double blossoms are a rich coral color with delicately fringed, light pink to white edges. Though the flower color lightens a bit as the flowers age, they remain an attractive shade of coral rose until they are fully spent. The flowers are complemented by the glaucous grey-blue foliage that forms a uniform, rounded, densely compact clump and remains attractive all season. As the series name implies, the beautiful blossoms have a strong, spicy fragrance which is even more noticeable when you cut them for your fresh bouquets. Try adding a few to your combination planters this spring. Pinks. PP#19660.